The L Assiette Champenoise Hotel is perfectly located for both business and leisure guests to Tinqueux. The L Assiette Champenoise Hotel boasts a convenient location with modern amenities in every guestroom and superb service. 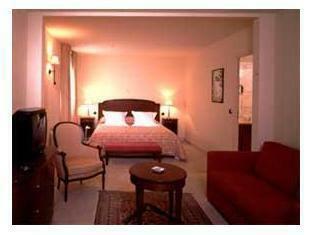 Each guestroom is fully equipped with air conditioning, inhouse movies, desk, hair dryer, in room safe, television. Guests can experience the high standards of comfort while staying at this luxury Tinqueux hotel with everything they need right on the site such as shops, elevator, bar/pub, laundry service/dry cleaning, restaurant, safety deposit boxes. Hotel's guests can experience on-site latest leisure and sports facilities such as indoor pool, sauna, garden. Along with its convenient location in Tinqueux, the hotel also offers a wide range of services and facilities to the guests. Being one of the good quality hotels in Tinqueux, guests staying at this hotel will find its convenient location and tranquil atmosphere pleasurable. To proceed with your reservation at the L Assiette Champenoise Hotel via our secure online booking form, please enter your period of stay.